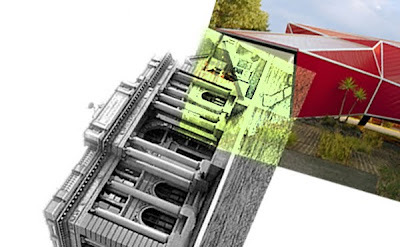 In this series I mentioned that there are some existing Experience Libraries that make use of the museum model, and there are also some existing Library/Museum partnerships. Here is a quick look at some of those. Many are not specifically with a children’s museum and all have varying degrees of collaboration. Cerritos Library, Cerritos, CA: This 88,000 sq. 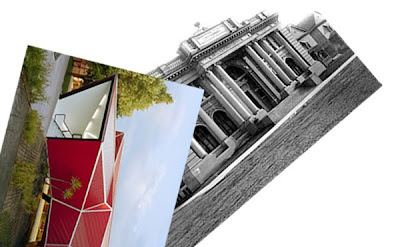 ft. public library has museum-like features throughout to encourage exploration. It showcases a permanent art collection, large dinosaurs in the children’s room, a green screen interactive, and changing exhibits. After opening the Library saw a 50% increase in circulation. Broward County Children’s Reading Center, FL: Not yet open, this building will combine a reading center run with the new 40,000 sq. ft. home of Young At Art. There will be a shared lobby, staff space and multi-purpose space. The partnership is based on the premise that art and literacy go hand-in-hand. Las Vegas-Clark County Library, NV: This Antoine Predock building houses the downtown public library branch and the Lied Discovery Museum. The museum rents the first floor from the library, which lives on the second floor. Although planned as a joint facility, the two organizations function completely separately. 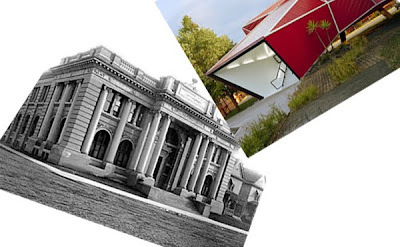 Hemphill Branch Library, Greensboro, NC: This project is based on the idea that early exposure to art benefits learning. The building contains a 15,000 sq. ft. library that contains a drop-in hands-on art studio for children run by the Green Hill Center for North Carolina Art. Library staff are cross-trained in running the art studio and the library hosts Green Hill at no charge. ImaginOn: The Joe & Joan Martin Center, Charlotte, NC: ImaginOn is a partnership between the Public Library and Children’s Theatre of Charlotte. The two organizations have a shared programmatic mission of bringing stories to life and exciting young minds. The building is fully shared by both organizations. In addition they have joint staff that manage facilities, exhibits, and programs. Highland Sam J. Racadilo Library and Environmental Learning Center, Highland, CA: This library specializes in environmental education. 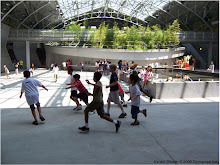 It features a zone with rescued animals, an outdoor classroom, a laboratory and a rooftop garden with native plants. Funding from the EPA allowed them to purchase a collection of books on environmental topics. In addition to story times they host “critter times” and educational programs. Queens Borough Public Library, Jamaica, NY: Keep your eyes open for a public announcement by this library sometime in late Spring/early Summer of 2010 about their Science in the Stacks partnership with the Exploratorium. It is NSF funded and promises to combine interactives with books in a new way. Let us know if you have come across others! 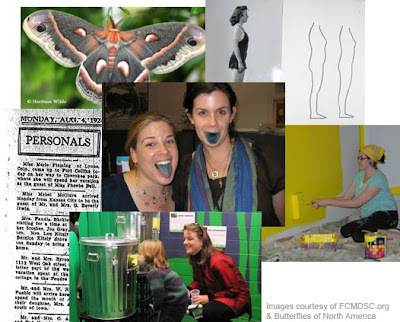 Children's Museums & Libraries IV: what does a blended model look like? 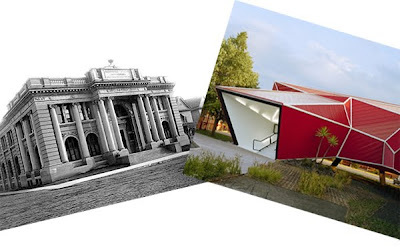 So what does a blended model that incorporates a library and a children’s museum together, under one umbrella organization, look like? 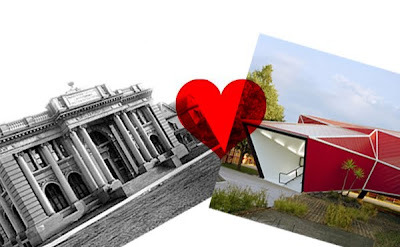 What distinguishes it from stand-alone children’s museums or libraries? By offering many modes of learning – cognitive, kinesthetic, constructive, social, experiential etc. – the blended model can support a diverse range of learners with different strengths and levels of development. It can encourage families to learn together in a joyful, active environment and set the stage for a lifelong love of learning. And it can continue to serve families and individuals as their needs and skills change. In providing a place to practice positive learning behaviors it supports the development of core building blocks of learning that underlie basic habits of mind and set children up for success as lifelong learners. By extending the resources of the library into a hands-on environment, and continuing the tradition where any question can be asked and investigated, a blended model can connect children’s playful learning with adult interests in the world. The ability to cross-pollinate ideas and share materials adds new functionality to traditional library services. 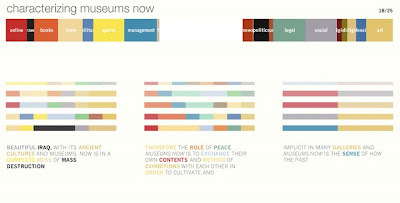 Information on public interests and trends collected by the Library through circulation patterns, e.g., can dynamically inform activities and exhibit themes. There are probably other Strategies that might help to articulate this blended model. If you are thinking of one, please let me know. This just came across my FaceBook desk. Looks like a super fun project out of MIT. You have to try it. "Enter your name, and Personas scours the web for information and attempts to characterize the person - to fit them to a predetermined set of categories that an algorithmic process created from a massive corpus of data. The computational process is visualized with each stage of the analysis, finally resulting in the presentation of a seemingly authoritative personal profile. Personas was created by Aaron Zinman, with help from Alex Dragulescu, Yannick Assogba and Judith Donath. " Children's Museums & Libraries Part 3: what's in it for them? Children’s museums have high activity levels and tolerate noise and mess. They often have technology, loose parts, and require skilled maintenance. Libraries are quiet. They have many cues telling parents that noise and physical activity only belongs in children’s rooms. This points to underlying differences in culture, training, and experience. They have different patterns of use and operating hours. Librariyy circulation picks up in the evening. They are closed on holidays, during school vacations, and often on Sundays. Children’s Museums are at their peak during holidays, vacations and on weekends and are usually closed by 5pm. Libraries don’t often have development or marketing departments. Instead, they typically have an MOU with the City that covers space, utilities, technical support, maintenance, and buildings and grounds. Museums might wish for a city safety net, but it’s a trade-off with their diversified funding model and experience raising capital and operating money. Together, a library and a children’s museum functioning as a single organization might be open from 9am-9pm, and offer different services at different times of day. They might combine City funding with grant-writing and annual campaigns and even have an endowment. They could be designed to provide activities for families while maintaining areas for quiet, focused, learning for adults. Bottom line is a blended model might be more flexible, serve a broader audience, and lead to a more robust funding model than would be possible as a stand-alone organization. In my first post on the potential of blending libraries and children’s museums at their root I focused on some of what children’s museums offer libraries. Beyond the common ground in their missions, children’s museums seem to meet a strategic need in the library community. In addition, one of my take-aways has been about the role children’s museums can play in community-wide discussions about families and children. Other organizations may work with these audiences on similar goals, but don’t understand multi-sensory, exploratory experiences. By incorporating the expertise of children’s museums into a library, the library is able to raise awareness about the needs of families, and how children learn, in a new way. This kind of blending offers a compelling vision for how the children’s museum model can inform out-of-school time learning and continue to spread the message of playful learning. But what can libraries offer children’s museums? This will be the topic of my next post. I have heard of libraries and children’s museums partnering on programs, sharing a building, and creating joint staff to manage overlapping operations. And some libraries are integrating hands-on exhibits with books. But a library starting a children’s museum is different. This is what we were asked to figure out for the Rancho Cucamonga, CA Library. I had a lot of questions. What does a blended model look like? How is it different from a children’s museum? What synergies might an expanded set of services offer? How do you organize the space and functions of a library and an interactive museum when both services are run by a single entity? In addition, there are organizational cultures and traditions to consider, and a significant difference in funding models. The value of a children’s museum to a library was immediately clear. For libraries, staying relevant is a critical issue. Many are reinventing themselves as community centers, hoping to be the hub of a learning community and a “third place”. And many are focusing on early childhood, recognizing that families need supportive, enjoyable, social learning experiences. As CA State Library Consultant Suzanne Flint said to me “Libraries are about wonder.” A children’s museum adds a dimension to this of trying, doing and figuring out. A children’s museum and library working as one entity can both ignite and sustain a passion for learning over a lifetime. We've been working on a marriage of sorts here at Gyroscope, and so far it's... great! About this time last year, we began working on a merger between the Discovery Science Center and the Fort Collins Museum. Think I've mentioned this before- it's called the Fort Collins Museum & Discovery Science Center (for now). Anyway, they took the big step and moved in together while they complete development, and will be building a new facility. In the meantime, they have been doing a fabulous job of learning to work together (in less space), prototype, collaborate- all while continuing to enrich the lives of their public. All images courtesy of the FCMDSC.org blog.